Hobleys Cottage is positioned on the edge of the charming village of Stanton which is widely regarded as one of the most picturesque in the Cotswolds. The refurbished detached Cotswold stone cottage overlooks adjoining countryside with walks directly from the door. It a perfect place to unwind and relax. Recently refurbished the luxury accommodation is light and spacious with a fantastic well-equipped kitchen and open plan dinning and sitting room. On summer days French doors open to the garden and terrace, perfect for alfresco dinning or barbecues while watching the sun set over adjoining farmland. On cooler days underfloor heating and a wood burner ensure you are always warm and cosy. The cottage is furnished with a mixture of designer and antiques furniture. White cotton bedlinen, dressing gowns and towels make your stay as comfortable as possible. Open the front door to The Cotswold Way, a paradise for walkers and cyclists, or why not ride over the Cotswold Hills at Jill Cadenzas’ famous riding school located in the village. Stanton Village dates from the 17th century, yellow stone houses line the village lane with postcard perfect cottage gardens. Within walking distance, the village pub, The Mount Inn, has breath-taking views over the valley and Landlady Pip serves local Donnington Ale while Landlord Carl prepares homecooked food. 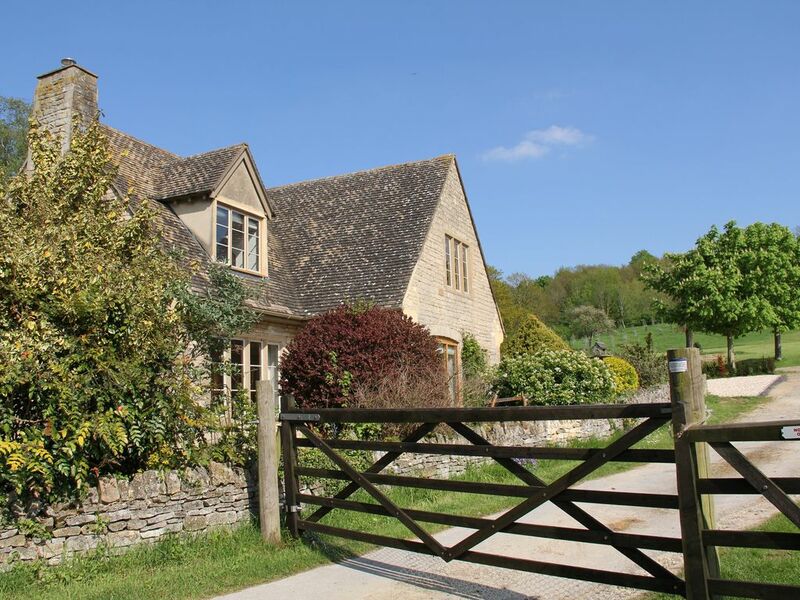 Hobleys Cottage is situated at Chestnut Farm, on the edge of the stunning Cotswold village of Stanton. The 17th Century Farm and stone buildings overlook pasture fields where sheep and horses graze. The cottage garden is perfect for relaxing with a glass of wine overlooking the fields. If you don't feel like cooking just walk to the village pub. Newley renovated the cottage is immaculate and presented to a high standard. TV in sitting room & both bedrooms, Netflicks. The ground floor is open plan with well equipped kitchen with NEFF double oven, microwave, dishwasher and induction hob, fridge and freezer. There is a breakfast bar and separate dining area which opens to the sitting room with comfortable sofas surrounding a wood burner. French doors open to the garden. There is a downstairs cloakroom with additional shower. A separate utility and boot room with washing machine and tumble drier. Wood floor with rugs. Two large bedrooms, one with double bed with ensuite bath and shower and one with either double or two single beds and ensuite shower room. Garden: private to the cottage. Private off-road Parking for four cars. Perfect for those wanting to escape to country life and enjoy the surrounding countryside. Great for walking being situated on the Cotswold Way, cycling and exploring. Private off-road parking and Hobleys has its own garden. Local Chef will deliver home cooked meals. To be booked in advance. The owner and housekeeper are on hand to help during your stay if needed. Hyperallergic pillows and duvet available. There is an unfenced stream that crosses the garden, while not deep or dangerous care should be taken wherever water exists. This is a farm with horses and sheep, though gardens surround the property. Care should always be taken while round animals and horses should not be approached. Wood is supplied for the wood burner. Local private tour and chauffer service - book in advance. Hobleys is situated in the idyllic village of Stanton with its famous village Pub The Mount Inn. There is so much to do in the area, you'll need to visit again. Wake up to stunning views over the adjoining pasture fields, a peaceful and relaxing setting and a perfect base to explore the Cotswolds. Walk to neighbouring Stanway House, a Jacobean Manor House & fountain & onto Hailes Abbey. Pick strawberries at Hailes Fruit Farm, have lunch at Broadway Tower, the Cotswolds highest Castle. Explore 15th Century Sudeley Castle & gardens and the historic town of Winchcombe 5.4 miles. Take the Steam Train from Toddington to famous Broadway 3.4 miles distance with antique shops, shops, deli and restaurants or explore Chipping Campden, Stow-on-the-Wold & Burford. Walk or cycle the Cotswold Way. Ride at Jill Carenza’s Riding School in Stanton. Visit Snowshill Manor and Snowshill Lavender, Batsford Arboretum or Adam Henderson’s Cotswold Farm Park as seen on TV. Visit Cheltenham Races and famous horse racing pubs The Plough at Ford or The Hollow Bottom. Play Golf at Broadway or Naunton. toilet, combination tub/shower, Bathrooms are newly fitted & have underfloor heating. toilet, shower, Bathrooms are newly fitted & have underfloor heating. off road and private parking for four cars. Milk, bread, butter and eggs, juice are supplied on arrival. Coffee and tea supplied. A newly fitted and well equiped kitchen including Neff double oven and microwave, dishwasher and belfast sink. Induction hob. Fridge and freezer. Breakfast bar. Underfloor heating throughout. The kitchen, dining room and sitting room are open plan. From the sitting room door open to a terrace with table and chairs and views to open fields. To the other side of the house is a lawn enlosed by Cotswold stone wall and yew hedge with views. Broadway Golf Club and Naunton Downs golf club are within easy reach by car. Hobleys Cottage is situated at Chestnu Farm on the edge of the village of Stanton. The famous Jill Carenzas riding school is in the village and guests can hack across the Cotswold Hills. The Cotswold Way is on the doorstep providing lots of walks to neighbouring villages and over the Cotswold escarpment. There are numerous bridleways for cycling. The house is beautifully appointed and the location is superb (footsteps from the beautiful village of Stanton and the Cotswolds Way Footpath). Sheep and horses linger right outside the garden. Gina gave us everything we needed for a very comfortable stay. Highly recommend. A lovely cottage, surpassing expectations. The quality of the renovation and furnishings is very tasteful and a lot of effort has clearly gone into the property. It has a high standard of equipment from the kitchen to the bathrooms, plus lots of hot water from a massive tank. Beautiful view across fields of sheep and horses and the cottage is on the Cotswold Way if you want a sign-posted walk. Charming pub with stunning views at the other end of the village, serves food and has lots of outside tables. Broadway, the nearest town has a great choice of restaurants, pubs and shops. It's a little hard to park but the benefit is a main street which is not covered with cars, plus there is a big car park in one of the side streets. The cottage puts you in easy reach of some great Cotwsold spots. We made it to Stow-on-the-Wold, Chipping Campden, Bourton on the Water, Broadway Tower and Snowshill Manor and had a fantastic mix of outings. The owners were really helpful with arrangements and very welcoming when we arrived. We had a great visit and hope to return! We are so glad that you enjoyed your stay and it was great to meet you. Wishing you the very best with the rest of your trip. Look forward to welcoming you again to Hobleys.